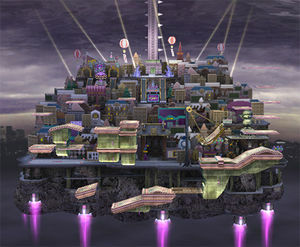 New Pork City as it appears in Smash. New Pork City (ニューポークシティ, New Pork City) is a stage in Super Smash Bros. Brawl and Super Smash Bros. Ultimate based on the location of the same name in Mother 3. In Ultimate, it is where Lucas is fought when being unlocked. New Pork City presents itself as a massive stage, being by far the biggest stage in Brawl. It is composed of dozens of buildings, giving the impression of a large city (hence the name), though the battle area consists of a series of platforms that seem to have no connection to the city itself. On the very right side of the stage, there are a series of thin platforms vertically arranged on top of each other, from which it is possible to do a stage jump with some characters. The top of these is the highest point on the stage, being about 3/4 of the way up to the upper blast line. To the left of these platforms is a swinging "pendulum" platform, resembling the swinging ship ride seen in the city's original appearance in the game. Directly below this is a large, sloped platform. The left edge of this drops down to a small cardboard layout of a building laying flat. This platform is breakable, and can result in early deaths if one is not careful. The left side of this platform is connected to another bumpy platform, connected to a slope facing downwards to the left. Directly above this are two very thick, floating cubical platforms connected to each other. The rightmost point of this is slightly to the left of the rightmost point of the slope. Directly left of the sloped platform is a small floating slope. This is between the large cubical platforms and a small, thin platform connected to a larger, cube-shaped one. To the left of this is the left-most point on the stage, a flat, small platform with medium thickness. The bottom-most point of the stage is a small limousine that flies from the left to the right of the stage, though this only appears sometimes. Far into the background is a silhouette of an actual city, despite the fact that New Pork City itself is floating and unconnected to it. Interestingly, the camera does not zoom in very much, even if all characters are near each other, even though it zooms in when the game is paused. The Ultimate Chimera appears a major hazard in this stage. Appearing randomly on the large right platform, the bottom platform with the breakable floor, or the two large leftmost platforms, it walks slowly and its bite attack results in 100% damage with very high knockback in Brawl, almost a guaranteed one-hit KO if not teched - which turns out to be quite helpful in event matches set in the stage, such as Event 27: Three-Beast Carnage, as the knockback applied is strong enough to trump the factor of the amplified weight of the giant opponents. In Ultimate, the bite no longer launches fighters, and instead deals an instant KO - likely as a result, the Ultimate Chimera roars when it first appears without attacking, giving nearby players a chance to get away. In Super Smash Bros. 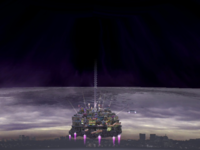 Ultimate, the Ω form and Battlefield form is set on a metallic structure designed similarly to the metallic hard platform structures of the regular form, and it is the same size and shape as Final Destination and Battlefield, respectively. The three soft platforms' designs resemble the soft platforms of the regular form. 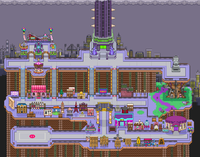 New Pork City as it originally appeared in Mother 3. New Pork City is the final location in Mother 3, where one of the Seven Needles is located. The city was built by Porky Minch, who forcibly brainwashed and gathered the inhabitants of the Nowhere Islands—along with various peoples across different time periods—in order to commemorate the destruction of the world by the Masked Man pulling the final Needle. Lucas and his partners were the only people invited to the city, chauffeured by a flying limousine. There are many attractions in the city, including an amusement park, a movie theater, an arcade, a restaurant, and the King Statue; however, most of the buildings in the city are actually just wooden billboards. The most prominent building, however, is the Empire Porky Building, which is a 100-story skyscraper where Porky resides. In this stage, the city itself is in the background and, for the most part, uses the original sprites from Mother 3; however, the size of the city has been greatly increased. The swinging platform bears resemblance to the pirate ride in the amusement park, and the destructible wooden platform on the bottom has a face of a building painted on it. In Mother 3, Porky gathered various scientists from different times and ordered them to create chimeras—creatures made through mechanizing animals or combining them with each other. The Ultimate Chimera was designed to be a killing machine; it is an incredibly dangerous creature feared even by its creators, and if Lucas approaches it, he'll be instantly defeated by its powerful bite. It was created in the Chimera Laboratory in the Murasaki Forest, and appears again on the Empire Porky Building's restroom floor. New Pork City has been banned universally in tournament play since the beginning of Brawl's competitive scene. The most significant of its problems is its extreme size and extreme amount of empty space; characters can live to absurd damage percents without the aid of a cave of life, and can easily outcamp slower characters just by running away. Besides being able to cause game breaking camping, this can make it impossible for matches here to finish without going to time, and greatly prevents matches from flowing smoothly. The stage is additionally difficult to traverse due to irregular floor design and platform placement and the aforementioned extreme amount of empty space, and the camera has issues with being able to zoom in properly, which further disrupts gameplay within the stage. The stage also has several walls, allowing for wall infinites and zero deaths, as well as places to tech against to extend survival even farther. The final major problem is the Ultimate Chimera, which while can be reasonably (and arguably easily) avoided, still has guaranteed OHKO power if a player is bitten by it in a stage where characters can realistically approach sudden death damage percents consistently, making it an overly powerful stage hazard that can have too large of an impact in a match regardless. New Pork City in Brawl. Lucas looking towards the background. The right side of the stage. Lucas is KO'd by the Chimera's bite. The Empire Porky Building, as seen with an unrestricted camera in Brawl. 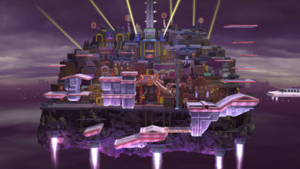 In Brawl, the model for the Empire Porky Building extends far above the stage, and it even pierces the stage's skybox. On the American version of Brawl, the stage selection screen refers to the stage as hailing from EarthBound, although it is not from said game. PAL versions of Brawl do, however, list the stage prefix as MOTHER. This localization error is fixed in Ultimate, where the stage prefix is now correctly listed as MOTHER 3. When Pokémon Trainer is selected, he will stand on the streets in the background. The Pigmask's logo appears stamped on all solid platforms. Fox, Falco, and Pit can perform the Laser Glitch here in Brawl. Unlike other stages, sometimes Shadow Sneak can warp Greninja off the ground in this stage. It doesn't always happen, however. This page was last edited on April 16, 2019, at 15:18.